Big Buckets of Stuff | PHIGs IMC Inc.
Over the last couple of days I’ve seen/heard some comments that Big Buckets don’t work well in Records Management. Uhm, you’re doing it wrong. I suspect that a large part of the issue is that classification models are too granular and too tightly coupled to the retention schedule. I’ve been involved in a couple of projects where this was the case. One client understood this, made the necessary adjustments, and achieved success. The other client … held steadfastly to granular, overly complex schedules and models, and is only now (4+ years later) re-examining their original plan. Note: During a Google Hangout yesterday (featuring @cawprhyd, @tchernik, @lllivingston, and some others whose twitter id’s I don’t have handy) the subject of disposition reviews for automated disposition came up. My position is pretty simple – you don’t need them. Sort of. 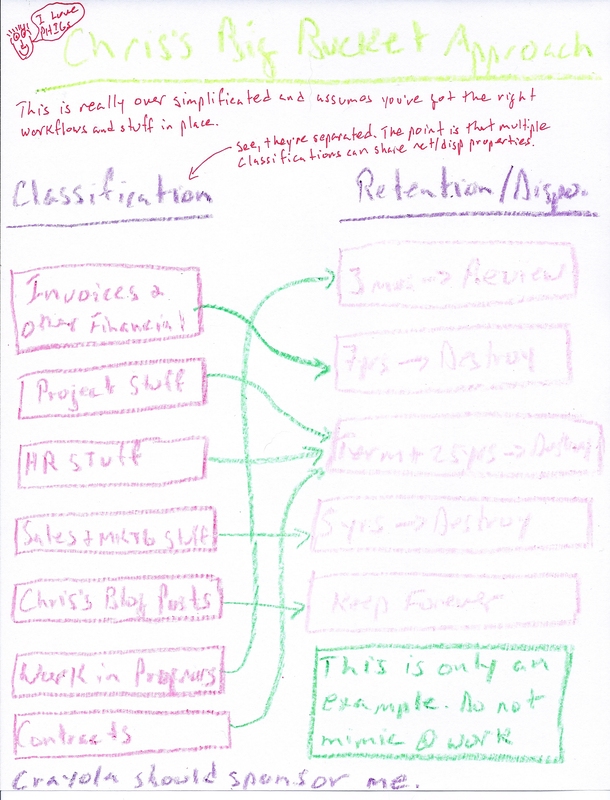 If you assume that classification and retention have been agreed prior to implementation, and that content is classified up front, there is no need to review. Of course, this works only on a day forward basis and requires that whatever tools you have in place can do the legal hold and suspend disposition processing / time clock when needed. You really should follow the twitterers that I’ve id’d here – they’re pretty smart. What were the comments that you heard? I don’t understand why they are doing it wrong? The comment I heard / saw most was a general “they don’t work”. Most orgs that try to use a big bucket approach do so without taking the necessary step of not managing information as if it’s paper. If you keep using a paper based model, you can’t effectively leverage cardinality and metadata to make things simple for the users. Very nice post Christian. Try to convince my hierarchy to put in place in File Plan. Can I use your very creative crayola example ?